Deborah wanted to create a new brand name, range segmentation and visual identity for her fabric shutters business. The new branding would work alongside her interior design business. Fabric shutters are a unique, attractive and practical alternative to blinds and curtains, especially for small windows, country cottages and children’s bedrooms. Deborah wanted to create a stand-out and memorable visual identity for the new business. An unusual memorable name that evokes colour, taste and texture. It was inspired by blending happy family memories of India with the lifestyle and tastes of the target customer groups. 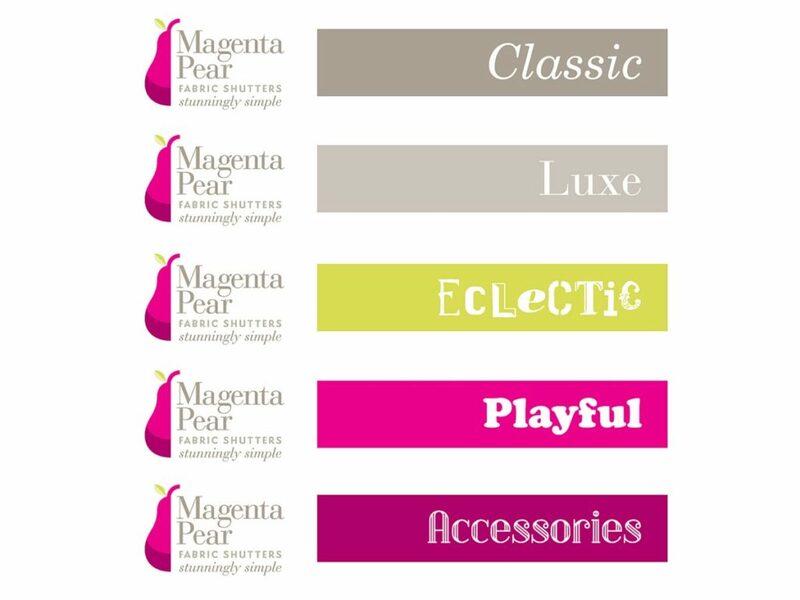 The combination of magenta, taupe, green and white is sophisticated and elegant, whilst retaining an air of freshness and fun. The semi pear is visually intriguing, contemporary, carefully balanced and subtly reinforces the brand name.